This week's installment of Cetacea photographs is literally all over the map. 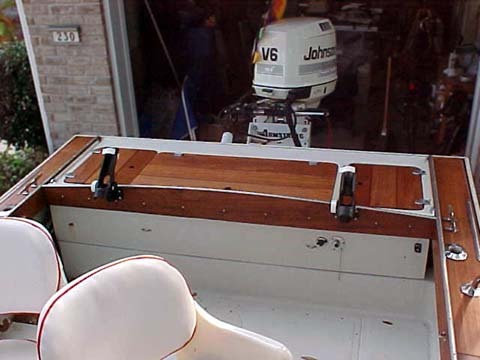 Our first picture comes from Texas where Jim Chorba is in the process of refurbishing his Whaler 25 Outrage. He has a rather unusual leaning post on his hands, and he'd like to know more about it. "This leaning post was removed from a custom equipped 25 Outrage from the late 70's to early 80's era. The dealer I bought it from thought it was "Whaler" original, but several people on the website think not. "I have found an original "Whaler" seat for the Outrage, so this furniture may be for sale. 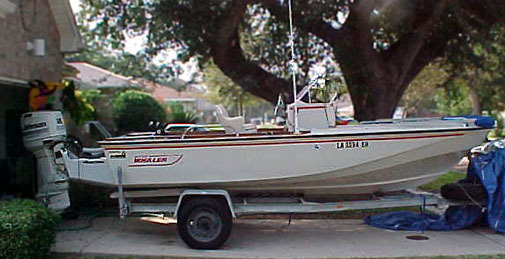 I have been told Boston Whaler did custom boats where "anything goes". I wonder if this may have been that case? "As you can see in the background, I have been accused of having a Whaler Navy, with a 1973 Bass Boat converted to a Montauk style, a 1987 18 Outrage now in process and a 1966 13-footer for quick trips. Your site has provided me a great deal of information, assistance and, in several cases, amusement. Thanks for a great job." Is this fine piece of furniture a Boston Whaler factory original? If anyone has good information on this leaning post, respond in the forum with your comments. Next stop, Louisiana and Jim Haupt's excellent Whaler 18 Outrage. We have seen some larger Whalers that have either Whaler Drives or Bracket mounted engines, but Jim Haupt <james.haupt@painewebber.com> has what so far seems to be quite unique, a Whaler 18 Outrage with a full transom and a big Armstrong Bracket. 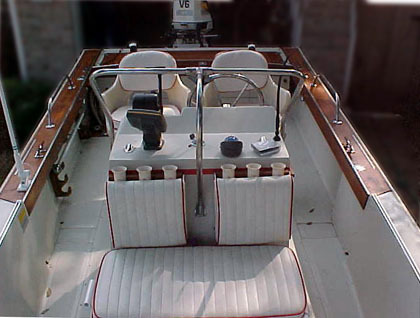 "The boat is an 1985 18 Outrage with the solid transom option. 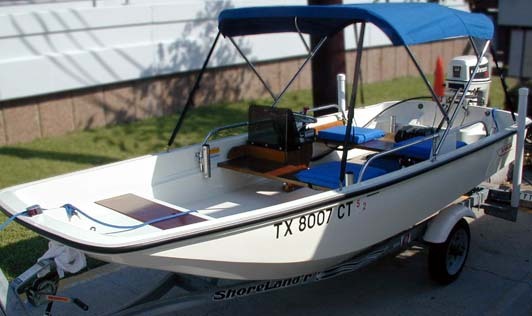 It was repowered in 1995 with a Johnson 150 Oceanrunner mounted on an Armstrong bracket. Also, in 1995 it was refitted with hydraulic steering. The boat carries a Standard VHF with 8-foot Shakespeare antenna, Hummingbird DX300 Fish finder w/ temperature and speed, Magellan 12 GPS, and Jensen Marine AM/FM/Cassette. 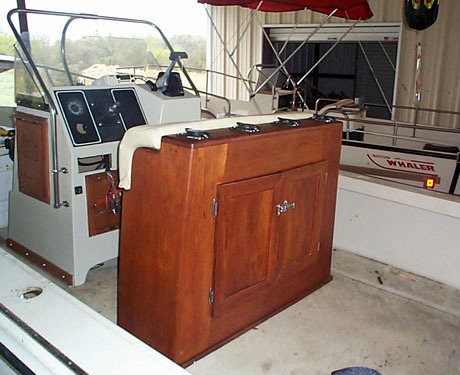 "The solid transom and resulting aft deck house a battery access hatch to starboard, a large removable fish box in the center (that can removed for further access to the aft bilge area), and a live (approx. 12 gallons) bait well to port. "The home port is the Southern Yacht Club on Lake Pontchartrain in New Orleans. The boat travels extensively around the Gulf Coast, from Louisiana to the Florida Panhandle and all points between, fishing, exploring and "scatting" for various sailing races. "I'm the third owner and bought the boat at an unbelievable bargain. I will admit, it needed some real TLC, though. All of the teak had been pathetically finished in varnish! Thirteen years of bad coat after bad coat, every year, with absolutely no sanding or prep work. 'Black and rutted' doesn't begin to describe the condition. Every piece of teak was removed stripped and sanded to a furniture grade, then oiled. All cast bronze fittings were replaced with solid stainless steel, as were the 8-inch aluminum cleats replaced with stainless. All stripes were changed from black to red and all new cushions were custom made with red piping to match. 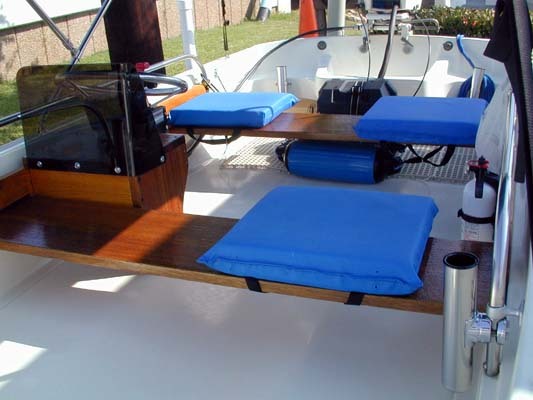 Both the bimini top and front dodger are 'sailcover blue' (both with original storage boots in excellent condition)." This is a rare boat: an 18 Outrage with a full transom. 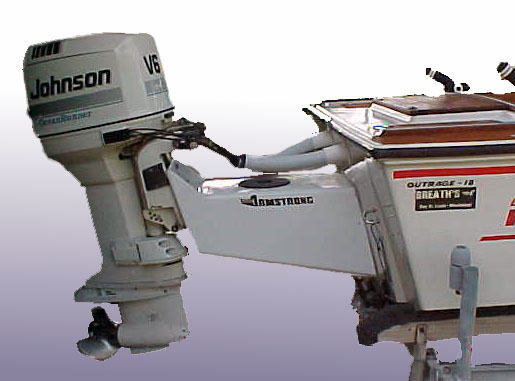 An Armstrong bracket has been mounted to it, carrying a big Johnson OceanRunner 150-HP outboard. With that bracket--it looks three feet long--I don't think this boat fits in a standard garage anymore! An Armstrong bracket has been mounted to the full transom. The set back distance is an amazing 30 inches. This view's angle makes the skeg appear to be reduced, but it is acutally intact and normal size. The interior upholstery has been redone, and red piping added to match the red accent/trim lines on the hull. The teak gunwales look beautiful, too. The full transom has three access hatches, all made from beautiful teak. 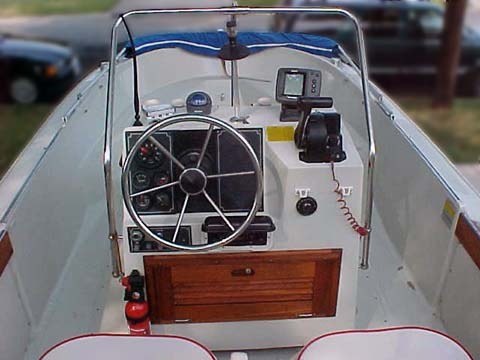 The Classic 18 Outrage has this nice center console helm position. The binnacle mount engine control is very handy. "I have finally been able to take some digital photos to send you. I hope they could be put onto the Cetacea section. "I would like to tell you how much I really enjoy the site. I think it is just great. I am certainly glad I came across it, but I don't think my fiancee is because I spend time each evening checking the forum. Remove all wood, hardware, rubrail, lights, etc. "An addition I made (which is not original to the 13) is a small plexiglass windshield. It is not really very much functional but I thought dressed it up a bit. The boat really looks like it could be brand new. "My boat is a 1978 model but it has no bow steps. Maybe the first of the 1978 models (produced in 1977) didn't have these steps which were supposed to be included in that year. 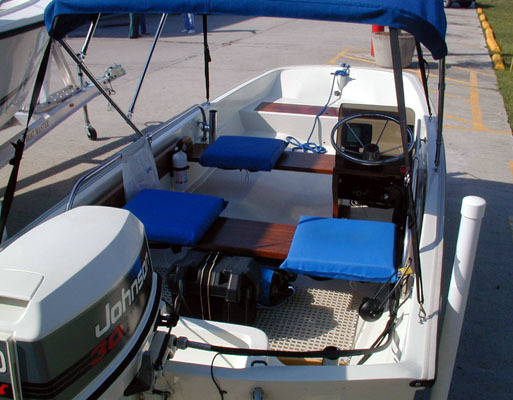 "It's a great little boat, and with the 1994 30HP Johnson I can go about 32 MPH with me and a six gallon tank of gas. "I recently bought a 1986 Montauk without an engine. I plan to fix her up as well but I think I will wait a few years to paint her. New paint looks great but it sure does scratch easily!" The little boat that started it all. They still look great! You can't beat a 13-foot Whaler for a small trailerable boat! With a new Awl-Grip paintjob, the boat looks spotless. And a very nice job of posing the boat for these photographs, too! Everything looks perfect.